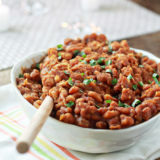 Vegetarian baked beans, dressed up for fall! 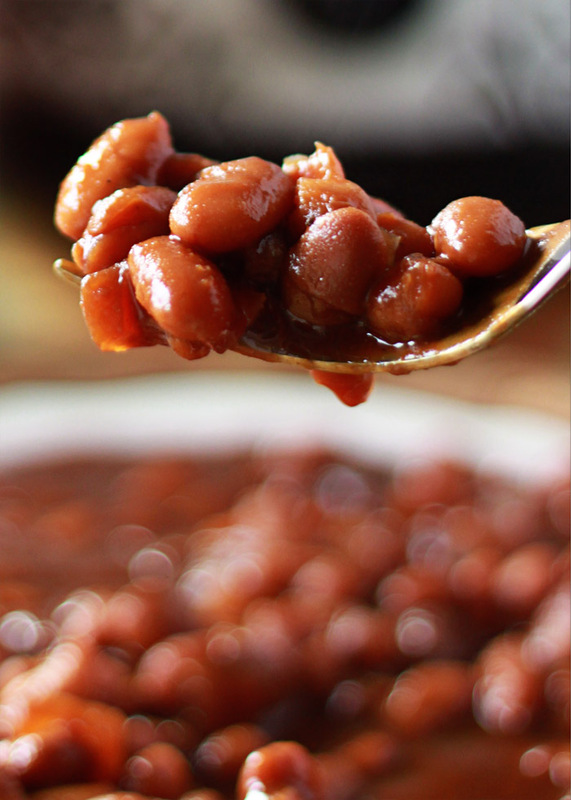 An easy Autumn-inspired spin on the classic side makes these baked beans perfect for the holiday table. And the Crock Pot makes them even easier! I decided this past summer that I was going to write an ecookbook. I was going to title it “Turkey Schmurkey” and it was going to contain 30 or so vegetarian Thanksgiving recipes that were so good, even the carnivores might not miss the bird – or at least, would be very happy to be served some of these dishes alongside. I started working on several recipes, and I even got so far as to wrap one up. Yeah. Just one. Turns out that in mid-July, it’s a lot easier to just throw up your hands and go hang out at the beach all day with your sun-obsessed toddler than to slave over a stuffing recipe. At least, for me, that was the case. 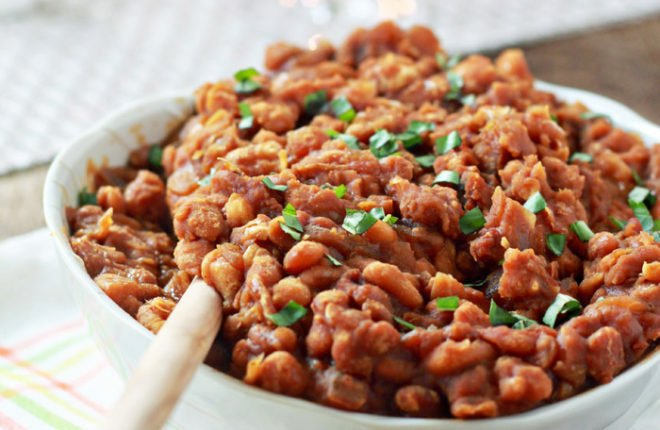 You may have guessed by now that this recipe for Slow Cooker Pumpkin Baked Beans is the one. You know, The One. The one completed recipe. I’ve kind of got a thing for baked beans, and lord knows I have a thing for pumpkin. So, you know, this was a pretty natural happening. 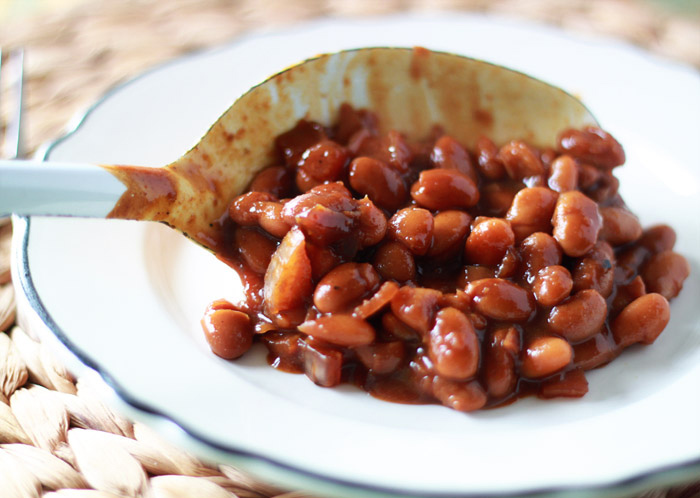 Turns out the pumpkin-and-baked-bean combo was surprisingly welcome in mid-summer, as baked beans always have a place at picnics and the like. But these are no ordinary baked beans, no no no. 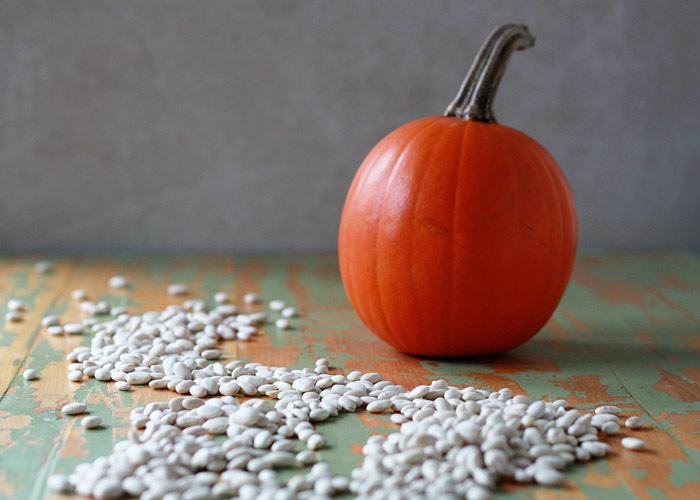 By now you’ve surely surmised that these pumpkin baked beans have pumpkin in them. They’ve also got some rich, hearty molasses in them, taking a cue from Boston baked bean recipes. And … psst … pumpkin pie spice. Yep, a little cinnamon, cloves, ginger, even a little nutmeg. Trust me – it totally works. They’re savory, but on the sweet side of savory, the way a good baked bean outta be. And, depending on how much cayenne you like, a little spicy too. 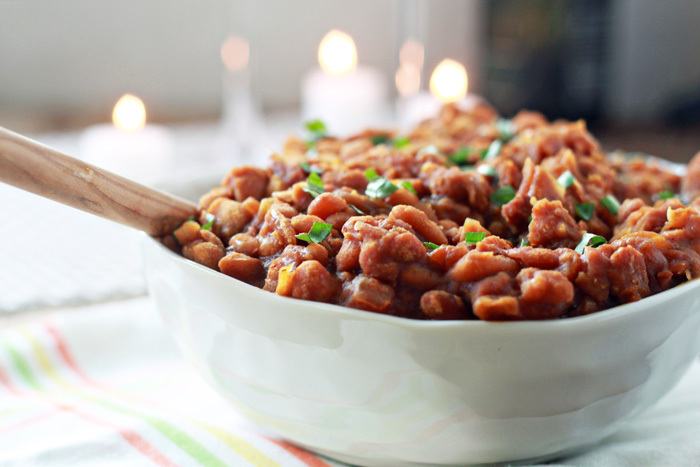 These baked beans are indeed perfect for the Thanksgiving table. The flavors are spot on, and the beans are hearty fare especially for vegans and vegetarians alike. Plus, they cook up in the slow cooker – one less dinner item to have to fiddle with come dinnertime. And hey, they might even have you and your guests declaring “Turkey, Schmurkey!” My (undone) job is done. Turkey Schmurkey! I love that idea! I also love me some baked beans and pumpkin, so I’m sure mixing it all up together would be just amazing. I don’t have a slow cooker (it’s on the list! ), but do you think this recipe would translate well to a Dutch Oven on the stovetop? What an awesome idea!! These sound amazing! I hope you finish Turkey Schmurkey one day! I would totally buy it 🙂 These beans look fabulous, what a great idea! I loved this recipe! I never would have thought to put pumpkin with baked beans, but now I think I will always put it in with my baked beans! Thank you for posting!